In a large skillet over medium heat, melt butter and add shallots, cook for 2 minutes, then add corn, red pepper, sugar, salt and pepper. Cook stirring occasionally to prevent burning, until the corn is slightly caramelized, about 6-7 minutes, then add cliantro. This can be served as a side dish, served over slice flank steak (recipe for steak will becoming along with cilantro lime cream sauce, the saute with the steak and cream sauce on top is delicious). You can also serve this in tacos or wraps as well with fresh grilled chicken. Place sliced chicken in a nice piece of boston or butter lettuce top with the saute and some fresh avocado, makes a great light summer dish. 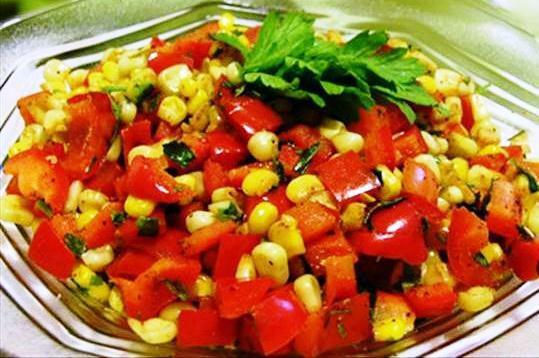 This is also great served cold over a nice summer salad…Enjoy! !